Here are some tips for cleaning your Dura-GRIT tools to help keep them long lasting. The already amazing working life of DuraGRIT® carbide tools, can be further extended by regular care and cleaning. Run the tip or wheel in the bristles of a wire brush at medium to low speed. Re-assemble the wheel to the mandrel, placing the red washer between the wheel and the mandrel. Place the wheel or tip on a saucer and spray with oven cleaner. Re-assemble the wheel to the mandrel, placing the red, fibre washer between the wheel and the mandrel. Note: DO NOT run hook & loop orbit sanders during cleaning. Vigorously rub the surface of the sheet, file or disc, with a stiff wire brush. TIP: TruSanders have dust collection channels behind the perforated carbide plate. Simply ‘tap’ the handle on the bench to clear sawdust. TIP: Save time and effort, use ordinary disposible discs for sticky surfaces and throw the clog away with the disc. Save your DuraDisc for clean sanding. Remove the carbide sheet or disc from the handle or sander. Heat the loop backing with a heat gun or hair dryer until the adhesive softens enough to peel off the loop pad. Lay the sheet or disc on a non flammable surface (e.g. concrete block) and burn the clog from the sheet or disc with a propane torch. When cool, rub the surface with a wire brush to remove burned residue. Re-mount sanding sheet to the handle. In the case of sanding discs, clean the non-grit side of dirt, dust and oil with Rubbing Alcohol and apply a new, white, DB-DL5-HD2, loop pad (click here for more details), carefully following the application instructions that comes with it. TIP: The best way to deal with stubborn clogs, is to avoid them in the first place. Save wasted time and effort cleaning. Use ordinary disposible discs for sticky surfaces and throw the clog away with the disc. 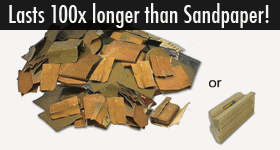 Use your long life DuraDisc for clean sanding. Never run DuraGRIT® tools with black mandrels, in reverse. Insert a DuraGRIT® extra strength, black mandrel into the collet or chuck of your drill, up to the shoulder. One piece shafted tools, insert at least 50% of the ungritted portion of the shaft into the chuck or collet. Do not mount a DuraGRIT® wheel or screw tip part, on a third party mandrel. Only use DuraGRIT® Extra strength black mandrels and screws. Do not touch a rotating DuraGRIT® tool. Do not use a DuraGRIT® tool that has been dropped. When cleaning DuraGRIT® tools, wear gloves, eye protection and respirator.